Inspire - Dream - Create - this is my new motto after attending the amazing Eat Write Retreat conference! Check out all the conference details in my recap! 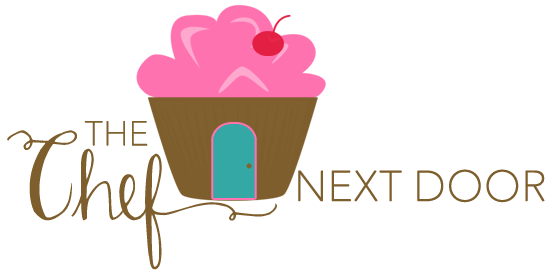 A few weeks ago, on my birthday to be exact, I had the most wonderful opportunity to attend my first ever Eat Write Retreat bloggers conference. Other than a couple of smaller, Michigan based conferences, I had never been to a big blogger conference. I was only able to attend with the help of my amazing sponsor, Stonyfield! So I'm sending a big, huge, fantastic THANK YOU to them for sponsoring me to go the conference. It was a fantastic experience, one that I won't soon forget, and I deeply appreciate all that they did for me. Eat, Write, Retreat was developed by a couple of pretty fabulous ladies - Robyn Webb and Casey Benedict - as a way to connect people in the food blogging community through cooking, writing and photography. Lucky for my I got to meet them both at the conference! During my weekend at Eat Write Retreat I became friends with some pretty amazing bloggers, interacted with some fantastic brands, and listened to a lot of awesome speakers! I took pages and pages of notes and now have tons of ideas to implement. The whole weekend really rejuvenated me! And with that, I'm going to share a little recap of that weekend and some of the things we did. Eat Write Retreat 2015 was held at the gorgeous Catalyst Ranch in Chicago. The Windy City, one of my most favorite places to go! And the Catalyst Ranch? Simply one of the coolest places I've ever been to. 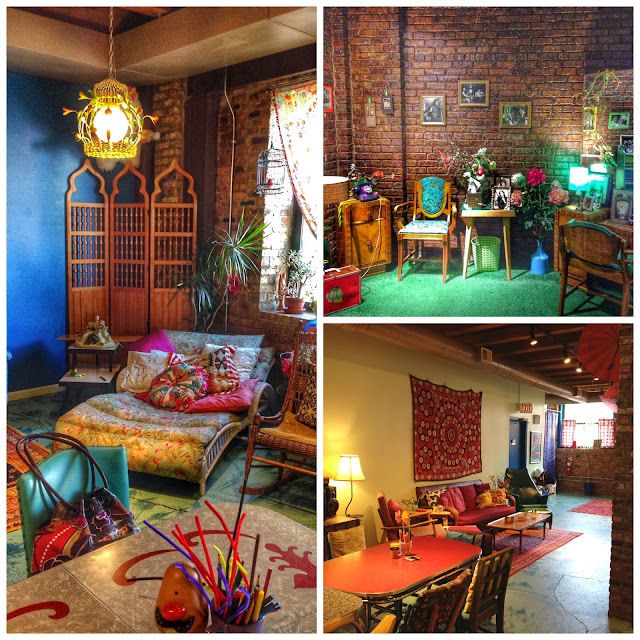 Super colorful, eclectic and homey. I would love going to work there every day! But I'm pretty sure if I did work there, you'd find me in the lounger below just about all day long! I'm backing up just a bit, but the Friday evening before the conference started we had a wonderful meet and greet reception at Frontier Restaurant. We had plenty of food and drink, lots of great conversations, and our sponsors were there to talk with us and let us sample and demo their products. 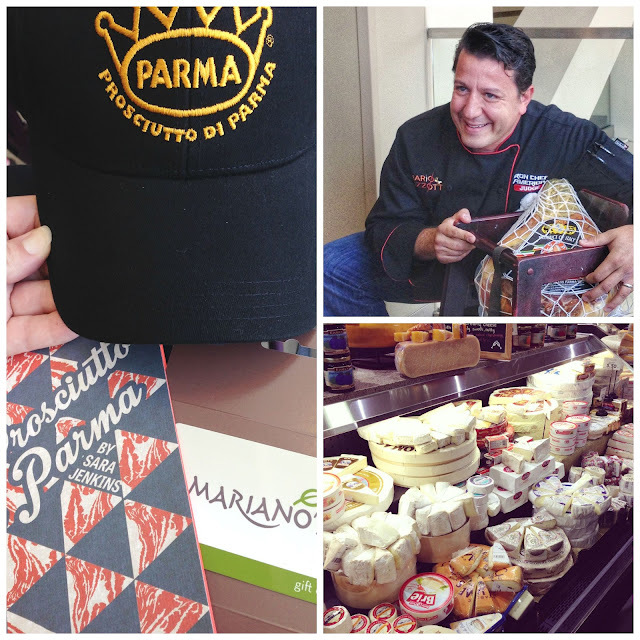 Big thanks to Gourmet Garden, Dreamfields, HBF International, Calphalon and Prosciutto di Parma for joining us! But the big highlight of my evening? The whole entire group singing to me and presenting me with my own birthday cupcake, candle included! I was just a bit embarrassed haha. Saturday started with a delicious breakfast at the Ranch, followed by our keynote speaker, Lorrie Thomas Ross, talking about developing our personal brand. I loved that session so much! I took A LOT of notes that morning, she had a lot of awesome things to say. A couple of things she strongly suggested doing were beefing up the "About Me" page on our blog, and also including a "Work with Me" page. I'm in the process of doing both of those right now! 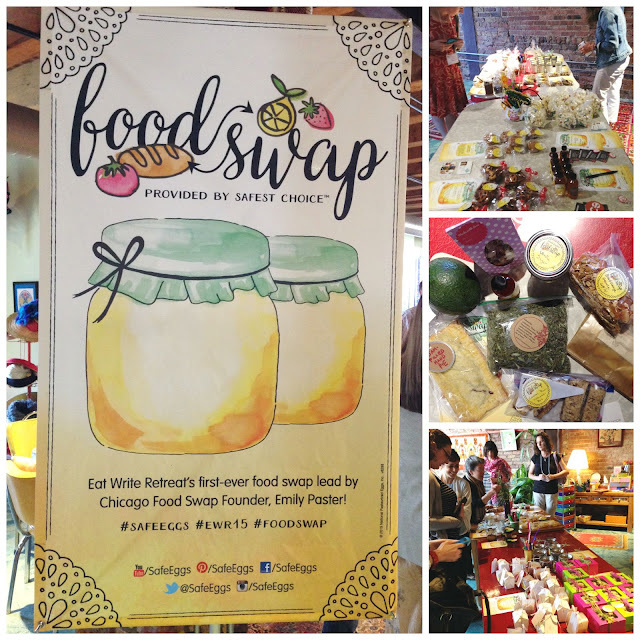 Next up on our agenda was Eat Write Retreat's first ever Food Swap! Led by Emily Paster, co-founder of the Chicago Food Swap, attendees were invited to bring something we made or grew to swap with one another. Before the swap started, Emily gave us some background on how the swap got started and how it works. I had never done anything like this before and let me tell you, it was a blast! The middle picture on the right below are all the goodies I swapped for and took home with me. Can you say YUM? Everything I received was so delicious and yes, that IS an avocado! A Reed avocado to be exact, straight from an avocado farm in California! The afternoon started at Mariano's Market. Chef Mario Rizzotti taught us all about Prosciutto di Parma, we had a tasting, received a tour of their beautiful store, then had lunch. I could easily live inside the cheese section alone! We also got to shop inside the store for an item to use in our consumer trends session later in the day. You don't have to tell me twice to go shopping! Back at the ranch we discussed consumer trends in the gourmet market with Thei Zervaki. She discussed the "hot" products locally and nationally and how to find out about new products coming out. 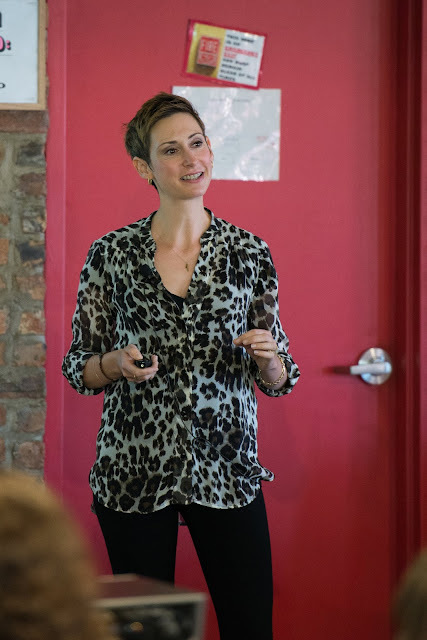 She also discussed the importance of developing recipes that include trendy ingredients. It was really quite interesting and eye opening as I've never payed that much attention to trends! Our last session of the day on Saturday was all about wrangling your social media accounts with Amanda Keefer and Amber Bloom from Produce for Kids. Again, another fantastic session! I'm on social media all day long, but I still feel like I have so much to learn. Amanda and Amber had tons of great information to share about different apps and tools that they use, analtyics, strategies, and so forth. My little notebook is full of notes and I have a long to-do list to work on! Saturday evening we had the most amazing Safest Choice Eggs dinner at Seven Lions. Each course featured a delicious Safest Choice egg, from our drink to the first course to dessert, everything was out of this world delicious. Sunday was our last day at the Ranch. After another amazing breakfast we had a fabulous session with Jason Logsdon, Sally Ekus and Robyn Webb all about publishing. This was literally everything you wanted to know about publishing a cookbook, from self publishing to working with a publishing company; from writing a proposal to book advances to royalties; from how to get started to the publishing process to creating a sample book. They told us everything! Now, excuse me while I go write a cookbook! Seriously though, this was super helpful information and the whole process is not as scary as one might think. I may become a published author after all! Our last session of the conference was all about protecting our brand in cyberspace with Patrice Perkins. We all know how scary the internet can be sometimes, recipes and pictures and our content can easily get stolen. Patrice taught us about intellectual property, trademarks, patents and everything we needed to know to protect ourselves. Again, a very important and informative session that every blogger should hear! 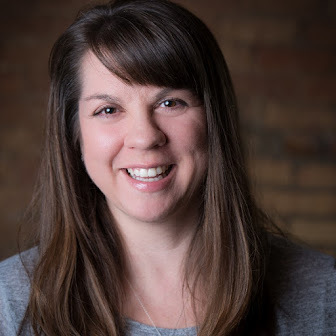 As the conference wound down, we got to build our own lunch before having the opportunity to have professional head shots taken with the lovely Dottie Foley. I did get mine taken and as soon as I receive my pictures you will be the first to see them! I'm really excited to get my hands on them and I hope they turned out well. We also got to speak with the sponsors before we left, and I said my goodbyes to everyone before heading off to the train station to begin my trip home. In the end, I had an absolutely fabulous weekend at my first Eat Write Retreat conference! I I'm thankful for all the connections I made and everything that I learned, and I can't wait to go back next year! Disclosure: I am honored to be a Stonyfield Blogger and member of the Stonyfield Clean Plate Club. Their sponsorship paid for my conference ticket and provided reimbursement for my travel and hotel accommodations to the 2015 Eat Write Retreat Conference! Thank you again to Stonyfield!